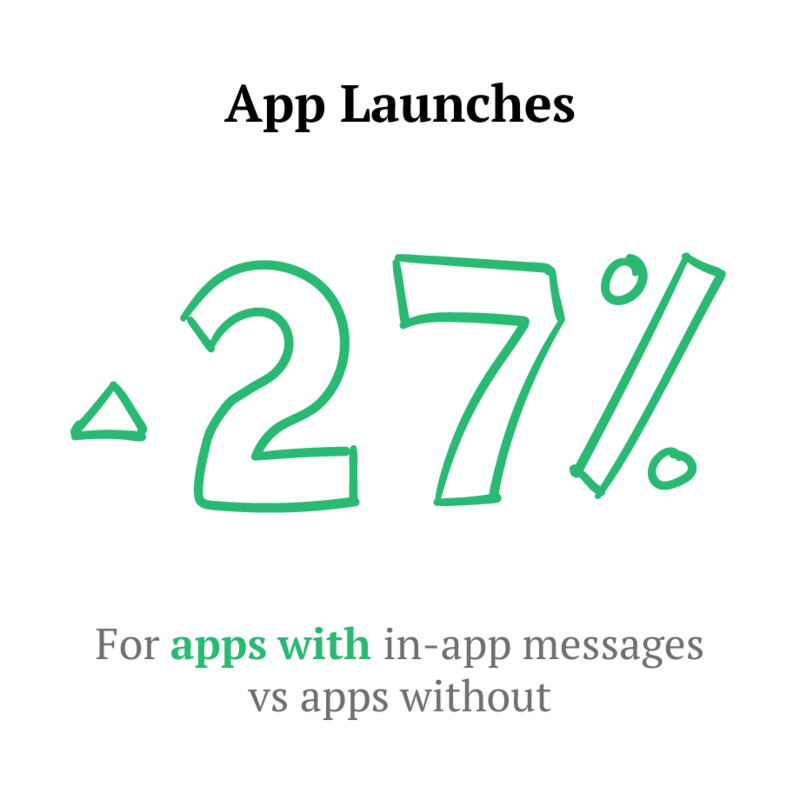 Learn how to drive 27% more app launches and double your user retention with in-app messaging. Push notifications are a lifeline from your app to your latent users; they’re designed to motivate people to return to your app. But once a user hops back on your app’s bandwagon, push has no more power to communicate with these users or, to influence their behavior. Push messaging has long been the darling of mobile. After all, push notifications help today’s app makers and marketers tackle a big challenge: capturing someone’s attention in an era in which goldfish – yes, goldfish – are more attentive than your average user and distraction is just a glance up – or a button’s touch – away. That’s why in-app messages are absolutely essential, they are the only way you can nurture and engage your active app users. Think of it like this: Push messages are the gatekeepers, the ushers, and the greeters that warmly welcome you to a store you haven’t visited in a while. Once inside, in-app messages are like the department signs, the clear pathways, and the floor personnel that help you find what you need efficiently. Without the in-store sales associate, the casual window shopper may just get lost in a labyrinth of merchandise (i.e. app features), never make a purchase, and never build a solid connection to your brand - which is why apps with in-app messages get 2-3.5x more loyal users! Push messages indeed help you regain attention. But in-app messages help you direct that attention into meaningful action. What is In-App Messaging Exactly? In-app messages are the pop-ups or notifications that appear when a user is active within the app itself. Unlike intrusive mobile ads that stick out like a sore thumb, in-app messages are a native part of the app experience, so they’re usually well branded and well designed. Put simply, in-app messages look and feel like they belong in the app. This form of messaging is also highly contextual and rooted in analytics, and can be triggered based on a user’s in-app behavior and attributes (such as location, gender, and device). They are a direct response to what your user is currently doing in the app. What is the Purpose of In-App Messaging? More and more people are demanding personalized digital experiences. Fortunately, apps collect a treasure trove of behavioral and profile data that can be put to use to create tailored app messages. In-app messages are a key tool in helping brands create that personalized experience because they reflect the actions a user is currently taking within an app – they are an immediate result of behavior. These highly relevant and real-time in-app messages nurture app users and boost engagement by gently nudging people through app funnels toward the ultimate in-app action (like subscribing, watching a video, or buying an item). A guiding light within the app, these personalized alerts encourage app exploration and discovery, increase session time, and spur conversions. Myth: In-app messaging is widely adopted by brands – everybody is already using it, and it won’t set me apart. Reality: In-app messaging is an underutilized tactic with untapped potential that you need to capitalize on right now. Despite being the only way brands can communicate with active app users, only 1/3 of apps actually employ this tactic. Yet, according to our recent research, when in-app messages are used effectively, there is a strong correlation with higher user loyalty and engagement. In fact, apps that send in-app messages show 2-3.5x higher user retention and have 27% more app launches than apps that do not. 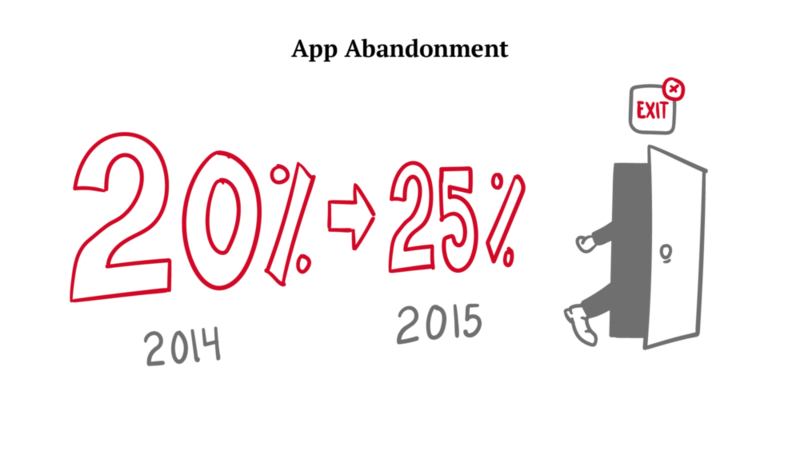 And since app abandonment has jumped from 20% in 2014 to 25% in 2015, in-app messages are an even more vital part of a healthy app strategy. Myth: In-app messages are akin to mobile ads, so my app users will find them annoying and spammy. Reality: In-app messages are absolutely not like mobile ads because they enhance, not degrade, the app experience. If in-app messages can yield such powerful results, why are companies so sluggish to send them? It may be because some brands erroneously confuse in-app messaging with mobile ads and therefore, assume their users will find these pop-ups distracting. But, there are stark differences between the two. Second, mobile ads claim a portion of your precious app screen, while in-app messages do not compromise the app experience. Third, even smart, relevant, and targeted mobile ads interrupt what a user is doing inside an app, whereas in-app messages are triggered based on a user’s current in-app behavior making these messages feel a lot more natural and fluid. By the way, in-app messages triggered from an in-app event are 4x more effective than those that simply appear whenever a user opens an app. And finally, in-app messages have a higher click-through rate on average (28%) versus mobile ads (0.56%). Now, this is not to say that in-app messaging is better than mobile ads – rather, that they are different tactics, with different purposes, and different benefits and results. Here is an example of a mobile ad for Living Social (which appeared inside Words with Friends and drove people to Living Social’s app store listing) versus an in-app message sent by Living Social (which helped active app users easily redeem an offer). 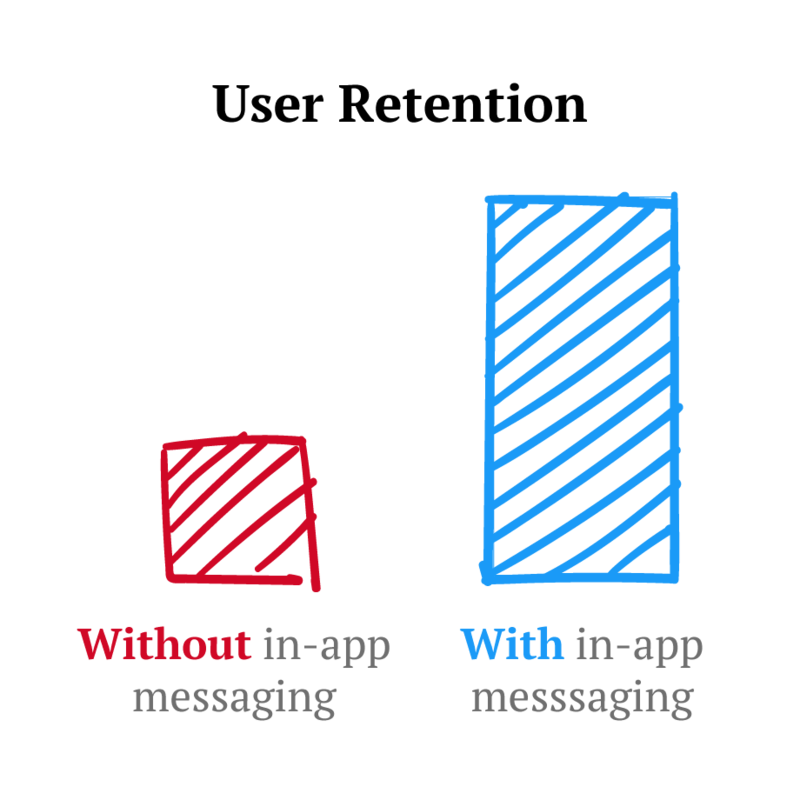 Myth: In-app messaging is the same as in-app chat. Reality: In-app messaging is for nurturing app users toward meaningful action, not providing one-to-one live service and support. While some brands mistake mobile advertising for in-app messaging, others think of it as in-app chat – which is also incorrect because in-app chat and in-app messaging fit into different stages of the user engagement lifecycle. Specifically, in-app chat is for retention whereas in-app messaging is for engagement and growth. In-app chat refers to a two-way, back-and-forth conversation that a user can have inside your app with a customer representative. Usually, this conversation is initiated by the user because he or she needs help, has a question, or wants to report an issue. In this way, in-app chat works to retain users by providing efficient and accessible customer support. On the other hand, an in-app message is a rich, visual notification that appears as a direct response to what a user is doing (or, is not doing, but should be doing) in your app. Unlike in-app chat, these messages are automated and set up by the app developer or marketer to appear at key points of interactivity. The goal here is to nurture users and help guide them through the app towards the penultimate in-app action. A strong app strategy needs in-app messaging as part of the mix, but not all in-app messages are created equal. In this section, we’ll walk you through the anatomy of a successful in-app messaging campaign, including how to use analytics, what variables to test, and what kind of content works. No two app users are the same, so an in-app messaging campaign that is sent to all active users will fall short. You need to segment people by their interests, attributes, and in-app behavior. For example, let’s say you want to boost purchases in your mCommerce app by giving people a free shipping promo code. As enticing as this offer sounds, it likely won’t appear relevant to people who have never browsed your in-app products (a better offer could be a message that encourages these users to view the latest in-app sales). And it especially won’t please people if they receive this free shipping promo after they’ve completed the in-app checkout process. All users who have visited a product screen at least twice in the last 14 days, but have not added an item to their cart. You could further slice and dice this audience by session length, country, etc., but the point is: in-app messages need to be targeted to the right audience based on their actions and characteristics. Once you have your target audiences selected, think about what these groups of users are likely to do next and set up in-app messages that trigger when they complete that action (i.e. event). In-app messages triggered from an in-app event are 4x more effective in converting users. If we return to the target audience from the previous section (the users who had viewed products at least twice in the last two weeks, but failed to actually add those items to their cart), the best time to show these users the “Free Shipping!” promo would be when they view another product. In this moment, the user would be actively thinking about something they like and want to purchase – they would be mentally primed for conversion. In this moment, the user would also be facing buyer’s dilemma – they would be teeter tottering on what to do next. And your in-app offer would be most welcome because it would sway them to buy. How do people flow through your app? What screen do they start at? Where do they go next? How do you want them to navigate through your app? What do you want them to do? All of these questions pertain to your app funnels – the pathways in your app that lead to a desired outcome or action. The goal of your mobile marketing is to move users across the golden conversion line, to the “ultimate” in-app action. So, understanding the various steps within your funnels, and whether users complete them or not, will inform your in-app messaging campaigns. By analyzing your funnels, you can pinpoint where users are falling out of a desired path and create an in-app messaging campaign that targets that drop-off. With your chosen target users in hand and an idea of where in the conversion funnel your campaign will work, create an offer targeted to address that audience specifically. The best in-app messaging campaigns are those born from data. Whether it’s an exclusive sale or discount code, access to premium content, or a prompt to follow your brand on social media, your offer should speak to your audience, fit the funnel, and serve to increase engagement and improve usage. It should also feel as though it’s a natural part of the app, and not an additional marketing initiative. A great in-app message arrives at the right time during the user experience and presents an offer in line with that user’s current actions. It speaks to their immediate need and feels like it was designed just for them. Unlike push notifications, which are limited in terms of copy and emojis, in-app messaging has room for longer content and richer creatives. Still, successful in-app messages are able to convey value in as few characters as necessary (nobody wants to read dense paragraphs on a small mobile screen!). To get users to engage with the message and not simply exit out of it, your content should be concise and persuasive. The headline should be clear and bold to capture attention, and the explanatory text should summarize the benefits of the offer and tell users how to redeem it. In short, the copy should answer the “What? Why? And how?”—what is the offer, why is it worthwhile, and how do I take advantage of it? Just like in the online world, your in-app message also needs a prominent call-to-action (CTA) to point the user to the next step or action they should take. CTAs are essential to converting people into loyal app users. Usually, CTAs that appear in in-app messages look like buttons; they are large, distinctly colored, and look “clickable.” Because you typically have a short period of time to engage the user, successful in-app CTAs stand out and prompt immediate action using quick verbs. There is no cardinal rule that says in-app messages can only contain one CTA. Secondary CTAs can provide an extra conversion opportunity for users who aren’t interested in what the primary CTA offers (as long as you add them in a clutter-free way). Take a look at Hopster’s in-app message below, which gives users a whopping four ways to convert. People respond better to beautiful visuals versus text-heavy in-app messages. So, add graphics, images, and other illustrative branding to your in-app creative. You want to catch your users’ eye, reinforce brand identity, and compel them to convert. You do not want to make your in-app message look like an intrusive mobile ad that feels out of place. Remember, the accompanying visuals in an in-app message should complement the copy in a way that reinforces the main point, increases brand credibility, and improves the click-through rate. We’re living in an attention-deficit era. Marketers have a few meager seconds to make a statement before your customer’s mind wanders off. When it comes to mobile, it’s even harder to make messages stick so you need to communicate quickly. That’s why you should use different fonts and/or font sizes to make the most important part of your in-app message stand out. When people look at your in-app message, what is the first thing you want them to notice? Make this big. And if they only stared at your creative for three seconds before hitting the “x” to close, what would they remember? Make these words different from the rest. For example, Free People uses varying colors, typefaces, and font sizes to make their offer pop right away. For example, Free People uses varying colors, typefaces, and font sizes and to make their offer pop right away. Marketing automation capabilities (i.e. event-triggered) for mobile are advancing rapidly, so don’t let manual roadblocks slow you down! With your target audiences in place, use automation to “auto-enroll” new users into existing campaigns as they meet certain criteria. This way, new users that fulfill these conditions will automatically receive the in-app campaign as soon as they qualify for it – ensuring you never miss an opportunity to convert more people. You should also “chain” messages together in a series so it’s not a “one and done.” When users re-engage with, or re-qualify, for an in-app campaign, they receive additional messages giving you insight into how linked offers impact behavior. A/B testing your mobile app used to be a complicated process involving engineering time and app store re-submissions. Now, you can A/B (and even C/D/E!) test your in-app marketing as easily as you do landing pages or emails. By using A/B testing with the addition of a control group (i.e. an unaffected, neutral segment of your users), you can get bulletproof insight into how different versions of an in-app message boosts engagement compared to a baseline measure. In essence, you can see the true impact of your in-app messaging campaigns. Use A/B or multivariate testing to gain additional insight – don’t be afraid to experiment! A marketing campaign is no good if you can’t reliably measure it. Send your in-app messages out through a closed-loop platform that dynamically connects marketing to analytics data. It doesn’t benefit you to have your app analytics separate from your app marketing because you’ll loose the power to act on your data with 100% confidence. And what’s the point of having data that you can’t act on? Smart app marketing is based on deep analytics that help you assess the health of your app based on initial campaign performance metrics (like impressions, click-through rates, conversion rates, etc.) as well as long-term metrics (like customer lifetime value). Which in-app message earned the most clicks? Which creative resulted in the highest lift in engagement? Which in-app campaign moved the needle on retention? These are the types of things app marketers should measure, and then based on the answer, repeat, refine, and move forward. Sold on in-app messaging, but not sure where to start or which campaigns to run? Don’t worry – now that we’ve brought you the race, we’ll make sure you start off with a bang. In this section, we’ll review some awesome examples of the top 10 in-app marketing campaigns, and show you how to set them up for strong results. Just as great leaders inspire greatness in others, this showcase is designed to help you kick-start your own high-performing in-app initiatives. Convincing users to opt into your push notifications is of paramount importance, but this is a big ask and should be handled with tact. After all, you’re asking for permission to ping a user and send messages to their smartphone’s home screen – on one of their most personal tech devices! Although Android users are automatically opted into push notifications, many iOS apps need to earn that right and often only get one shot at serving up the native iOS push opt-in request. That’s where in-app messages can help. All app marketers should consider launching a pre-permission in-app message that outlines the value of your push notifications (i.e. why is it worth opting in?) and tests a user’s interest level in subscribing. This is the perfect safety net: If users say yes, you can go ahead and launch the iOS permission dialogue and have users opt-in for real. If users deny your request, no harm done – you simply don’t trigger the official iOS permission dialogue (which you can only launch once, so choose your timing carefully!). Instead, you can work on providing value and attempt the opt-in request again at a later point. Summary: Use a custom in-app message to increase the number of people who opt into your push notifications. When to Run This Campaign: If people already have a strong connection to your brand, then trigger this in-app message during their first app launch. Otherwise, trigger it after a user completes a key in-app action or has had a few sessions with your app. In fact, our research has found that the average push opt-in rate skyrockets from 35% to 70% if apps make this request during a user’s 4th-6th session versus their 1st-3rd sessions! News App - All users who have read at least three articles in the last week and have had more than one app session. Trigger this in-app message as soon as these users finish reading their fourth article. Travel App – All users who have searched for flights in the last three days and have spent more than three minutes browsing hotels in your app. Here’s the truth about releasing new features: these updates or other version changes are easy to overlook. Many users set their apps to auto-update and miss out on important releases. This can cause in-app confusion or generally little use of new features out of the gate. Using an in-app message to highlight big changes and how to use these new features draws attention to your hard development work and gives users a better sense of how to go about enabling these new features. While the content of this in-app message is simple, the magic here is in targeting. Users who have not interacted with a feature can be shown a video or a tutorial with a deep link to that feature. This type of in-app message is an excellent way to increase session time and make hot new features more discoverable. And if your new feature was highly requested by users, this in-app message shows people that you listened and care about their feedback. Summary: Use in-app messaging to highlight cool new app features and teach people how to make the most of them. When to Run This Campaign: When you launch a major feature or app upgrade and notice a segment of users who have not tried it out. Social Media App – All users who have had an app session in the last week, have sent at least one message to a friend, but have not used an emoji in their messages. Trigger this in-app message the next time these users start typing a message. eCommerce App – All users who have purchased an item in the last month, but have not clicked the “one-touch checkout” button on the checkout screen. Trigger this in-app message when these users add another item to their cart. Finance App – All users who have more than 20 account transactions per week, have missed at least one payment in the last 30 days, and have not used the new budget feature. Trigger this in-app message when these users open your app again and visit the “Monthly Statement” screen. Not too long ago, websites were our go-to for the information we needed on a daily basis, which is where brands embedded social sharing buttons. Now, we’re living in an era in which businesses are agile and people are always on the go. As a result, we spend a lot of time reading articles, listening to music, and watching videos on mobile gadgets. So, what’s an app marketer to do? You need to make it easy for people to share in-app content via an in-app message. 1) You’ll get to carefully control its timing and ensure this reminder to share only pops up when the user has a positive experience with your app. 2) You do not compromise precious screen space to permanent social media buttons. Summary: Use an in-app message embedded with social CTAs to encourage users to invite their friends to your app, share your in-app content, or brag about how close they are to achieving a goal. This will expose your app to new audiences, grow your social reach, and inspire others to keep interacting with your app. When to Run This Campaign: After users have spent some time in your app, or have completed a significant in-app event, or have hit a new milestone. Fitness App – All users who have tracked a run with your app this week and have beaten their previous best running time or distance. eCommerce App – All users who have purchased more than three items in the last month. Launch this in-app message the next time these users visit the “What’s Hot Now” screen. Media App – All users who watch a full video in your app. Look at your users’ in-app habits. What types of content do they consume? What screens do they spend the most time on? What features do they use most? Then, use this information to create “just for you” in-app campaigns. In short, understand your users and make thoughtful, educated recommendations on similar stuff that you think they’d like - be it a new song, article, product, nearby event, etc. Summary: Personalization is a great goal, but most people are not sure how to achieve it. Using an in-app message to test recommendations on different customers is the right way to foray into this space. When to Run This Campaign: After you have collected data on users’ preferences, interests, attributes, and in-app actions and want to increase engagement. eCommerce App – All users who have purchased an outerwear item in the last week, but have not visited the “Shoes” app screen. Trigger this in-app message two weeks after the purchase (to account for shipping time) and launch it when these users return to the app and visit any product screen. Sports App – All users who have selected the New England Patriots as their favorite team, but have not read an article about football in the last 24 hours. Trigger this in-app message when these users are on the “Top Highlights” screen. Music App – All users who have listened to at least 10 songs from the pop genre and have downloaded more than one Taylor Swift song. Trigger this in-app message the next time these users play a Taylor Swift song in your app. Sample In-App Message – “Look out music world! Taylor Swift is back with another jaw-dropping single. Listen now. Even if your app included a mini-orientation or a series of onboarding screens, it’s possible that some users skipped through these – or simply forgot the details. In-app messages are perfect for surfacing quick tips about how to better use your app and get more out of their experience. In-app messages work particularly well at providing helpful instruction because they don’t disrupt the UX by taking the user to a different screen just to give them a suggestion – they are low-friction. Summary: Use an in-app message to give users tidbits of how-to’s or share hidden or unused app tips and tricks. When to Run This Campaign: Trigger these in-app messages after users visit an app screen and fail to use a feature that could help them use your app more efficiently. Gaming App – As soon as users fail to conquer level five. Finance App – All users who start the tax filing process in-app and get to step four. You could further refine this segment with profile attributes like job role, marital status, and employment status. Health App – All users who have previously documented their daily meals to estimate calorie intake, but have not used the camera tool. Trigger this in-app message the next time these users click on the “Enter Meal Details” button. Your app can also play a big role in engaging your customers across a multitude of channels. To do this, create a cross-platform promotion or contest and launch it via an in-app message. The basic premise here is this: if people are engaged enough with your brand to download and use your app, they will likely also be willing to connect with you on other channels too. An in-app message that encourages users to visit your website, follow you on social media, or visit your brick-and-mortar location will deepen your relationship with customers, increase loyalty, and give you more avenues for communication. Plus, you’ll learn more about your users’ lives outside the app, which can better inform your app marketing campaigns. Summary: Use in-app messaging to cross-promote your other marketing channels. Show people what they’re missing out on by not visiting your website, following you on social media, subscribing to your emails, etc. When to Run This Campaign: When users have had a few sessions with your app indicating they are well engaged on mobile and may be ready to connect with you elsewhere too. Sports App – All users who have at least one app session per week, have visited the “Scores” app screen more than five times, and have read one article in-app. You could further refine this segment by favorite team, favorite sport, gender, and country. Trigger this in-app message the next time they visit the “Scores” screen. eCommerce App – All users who have browsed more than 10 products in your app and favorited at least three things. Trigger this in-app message after these users favorite another item. Real-Estate App – All users who have conducted a search for property listings in the last seven days. You could further refine this segment by neighborhood, budget, location, etc. Trigger this in-app message the next time these users visit the “Search” screen. Launching something spectacularly cool and want to capture user attention? Use an in-app message. For things beyond feature updates or upgrade details, in-app notifications - with their advanced design options - are the perfect tool for making a splashy announcement. Summary: Give your app users a sneak peak of big changes your brand is making with a flashy in-app alert. When to Run This Campaign: Let your users know as soon as your announcement is public or about to be public. This campaign could be one of those rare instances in which it’s acceptable to target all app users. Everybody loves a good bargain, a special discount, or an exclusive promo code. So, surface these offers to your users via an in-app message to increase conversions and prevent people from falling out of a key app funnel. If a user is on the cusp of completing a major in-app action (like buying an item, or subscribing), these in-app messages can nudge him or her over the finish line. The goal is to tackle mobile “cold feet” by sweetening the deal even further. Summary: Use an in-app message to make an attractive offer to a user that will spur them to make an in-app purchase. When to Run This Campaign: When users are close to completing an in-app conversion, but navigate away to a different screen before finishing the process. Or, trigger this in-app message when users near content limits (i.e. as they get close to hitting a paywall). News App – All users who have at least one session with your app per week, have read more than five in-app articles, and have selected topics of interest. Trigger this in-app message when these users select another article to read. Music App – All users who open your app more than three times during the last week, listen to at least five songs, and visit the “Playlists” screen in your app. eCommerce App – All users who added an item to their cart, but navigated away to a different part of your app before checking out. On the flip side of promotional in-app messages, transactional in-app messages are all about being intrinsically valuable. That is, these in-app messages increase your app’s efficiency and improve your users’ lives by providing highly personalized and relevant information in real-time. Two common use cases for this type of campaign include summarizing the details of a transaction (“Click to confirm”), clarifying an error (“X went wrong”), or preemptively avoiding a user mistake (“Are you sure you want to do that?”). Transactional in-app messages are not designed to overtly market your app – they are designed to make things flow smoother, which in turn increases your app’s reliability and retention. Summary: Instead of navigating people to a different screen, use an in-app message to give people peace of mind that their transaction went through and shed light on any issues. When to Run This Campaign: Before or after a user completes a major in-app action. Finance App – All users who have integrated their stock portfolio into the app, have selected a few stocks to “watch,” and have made at least one trade in your app within the last seven days. Trigger this anytime these users want to make another trade. You could further refine this segment by adding a profile attribute, like portfolio value range, income bracket, and last trade date. eCommerce App – All users who complete an in-app purchase. You could further slice and dice this by gender, last item purchased, home address, etc. Fitness App – All users who have previously tracked a run in-app, have completed a running goal, and click the “Fresh Start” button. The NPS survey is a universal use case for in-app messaging. This is a customer relationship survey that seeks to understand how satisfied your customers are with your business. An in-app NPS kicks off when you simply ask your users how they like your app. If they say they do indeed enjoy your app, you should encourage these promoters to rate your app in the app store and recommend it to their friends (thus boosting your App Store rank). If users say they’re dissatisfied with your app experience, you can politely ask these detractors for specific feedback so you can improve. And because you’re executing these surveys inside your app, you already have the users’ attention, and are likely to receive valuable responses. Summary: An in-app NPS empowers brands to identify happy users and learn from unhappy ones. NPS surveys carried out via in-app messages can get you quick feedback and allow you to react in real-time by providing users with an outlet for further expression based on their score. When to Run This Campaign: Do not launch this campaign during a user’s first session with your app! Instead, wait until they have a positive experience with your app (like successfully completing a purchase or reading a full article). Music App – All users who listen to at least six songs in a row. Travel App – All users who book new flights or a hotel in-app and have previously booked flights or a hotel in the last six months. Finance App – All users who complete at least 20 in-app transactions per week and have more than three app sessions per month. Trigger this in-app message after these users complete their 25th in-app transaction in a week. As apps become more robust and complicated, in-app messages will play an even larger role in guiding users toward meaningful interactions. Without in-app messaging, you have no way to communicate or engage with active app users and in turn, no way to influence your app’s ROI. Don’t forgo your chance to drive 2-3.5x higher user retention and 27% more app launches. Don’t underutilize or underestimate the power of in-app messaging. Be part of the forward-thinking band of apps that are creating real value by employing in-app messages to make their users more successful.